This is certainly one of those books that I should have already read before now - it is even still required reading in my state for 12th grade English, but being that I took a different English class that year I was never exposed to it. All I knew about this book was it's opening line before a week ago, now I am amazed (for several reasons) that I did not know more of it sooner. A Tale of Two Cities tells the story of Lucie Manette and her family during the time of the great French Revolution of 1789 and the reign of terror. Lucie's father is a Frenchman who was unlawfully imprisoned in the Bastille for 18 years. When he is released, his daughter is brought from England to take care of him and bring him back with her to a friendlier country. A few years pass, and Lucie and her father develop a relationship with a charming young Frenchman named Charles Darnay, whom Lucie marries. While all this is happening, the French people organize and revolt against the tyranny of their king and aristocracy, bringing about the revolution that develops into a period known as "the reign of terror". The guillotine is introduced and all of the aristocracy are put to death one by one, including children and their servants. Once the true oppressors are mostly taken care of, no citizen is safe from accusations against their stance on the new government, and the people start inflicting the death penalty at random to anyone accused and sentenced by a "jury of their peers". Unbeknownst to Lucie, her husband is actually a member of the French aristocracy who gave up his title willingly years before because he did not agree with the treatment of the lower classes. When Charles left France for England, he changed his name so that no one could find him, and left his property to be given up by his servants. 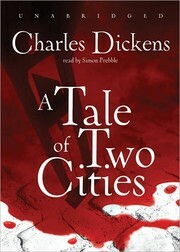 When his most trusted servant writes to him to say that he has been arrested in his master's stead and sits in prison waiting to be executed, Charles heads to France to keep the innocent man from dying for him, safe in the hope that he can use his altruistic back story to save himself from death when the time comes. He arrives in Paris on the 15th of July - just after new laws are passed and all "foreigners" are claimed to be on French soil unlawfully, so Charles is thrown in prison. Lucie and her father and child go to Paris to try and plead for her husband to no avail. The family lives in Paris for over a year while Charles sits in jail waiting for his trial. In the meantime, Lucie's father makes his story known to those in charge of the revolutionary government and is treated as a national hero of sorts. He does everything he can and secures his son-in-law a not guilty verdict. The day that Charles is released, he is arrested again on different charges, of which Lucie's father can do nothing about. As a person who studied French language and history as my college major, I am honestly ashamed that I had not read this book sooner. I never even really knew it was about the revolution, not to mention how brutal an account of this time it would be. The reign of terror was no joke - no one was safe from being accused of "terrorism" (for lack of a better term), and just those accusations would make you meet St. Guillotine. The original motto of the new republic was "Liberty, Equality, Fraternity, or Death", only to have the death part removed a long time afterward. The accounts of what it was like to live during this time in this book are gruesome to say the least. This was a brutal time where friends turned on each other and then not only watched as their head was cut off but them paraded the head around on a pike like a trophy. The ending to this story though, is nothing short of beautiful. I never really thought I would use that word in describing a book before, but there is no better way to put it than that. I found myself reading the ending a few times after I finished the book just to experience that moment of beauty again. It was very moving, especially considering the horrible atrocities being committed around it. I cannot recommend this book enough and it absolutely deserves its place on the lists of best books ever written. I give this book 5 out of 5 stars.